>I have assembled a list of websites that offer games to practice math facts. I posted these sites on my wiki. The link is Math Facts Websites I you have any recommended additions please add a comment to this blog posting with the name and website address. 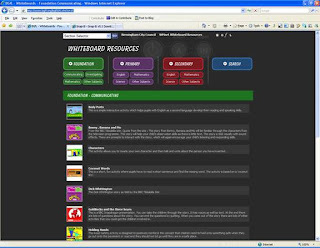 >Here is a presentation that lists 38 interesting ways to use your interactive whiteboard. You can also check out the main site www.benfranklin300.org. Here you can view an online exhibit developed to celebrate Ben's life and accomplishments. >Google has introduced some new experimental search features. See results on a timeline, map, or in context of other information types. With these views, Google's technology extracts key dates, locations, measurements, and more from select search results so you can view the information in a different dimension. Timeline and map views work best for searches related to people, companies, events and places. Info view shows all the data found for each result, to help you select the best choice. You can access these features by visiting the experimental search page in Google Labs and turning on the feature. You also can add the following terms to your searches to utilize the features. The results will display in timeline view. You will have the opportunity to switch the search results by: Dates, Measurements, Locations and Images. The results will appear in map view. Google has also released a news timeliner: http://newstimeline.googlelabs.com/. It allows users to view news and other data sources on a browsable, graphical timeline. Available data sources include recent and historical news, scanned newspapers and magazines, blog posts, sports scores and information about various types of media (i.e. music albums and movies). To dive into the Google News Timeline experience, simply enter your topic of choice, pick out the relevant source and specify the date. The result is an interactive news timeline based on your personal interests. By the way, you can set the time scale to days, weeks, months, years, or even decades!